In years past our passion was breeding, and showing Champion AKC purebred dogs. We spent 40 years under the name of "Oak Leaf Kennels" concentrating on German Shorthaired Pointers. We produced 50 + Show Champions, Hunting, and Obedience Title holders. Ch. Wyndbourne Keepsake the number 1 Show GSP in the U.S, for 2 years, was Sired by our Ch Wyndbourne Bustin Loose. We also finished Championship Titles on English Cocker Spaniels, Poodles, and Smooth Fox Terriers. Many of our breeding sold to multiple foreign countries. We traveled from coast to coast attending dog shows, and performing occasional judging assignments, and establishing lasting friendships. We enjoyed studying genetics, and the creativity of breeding top quality animals. In 2004 we both retired, and returned to Texas from California, just for fun we visited the Cattle Drive in the Fort Worth Stockyard. That was all it took, we immediately fell in love with the amazing Texas Longhorns on exhibit. We set out to learn as much as we could about Texas Longhorns, the more we learned the more impressed we became with this "Historic Icon of the West". It did not take long before we were totally hooked on beautiful Texas Longhorn cattle. We immediately started our search. After finding three beautiful heifers, we said we want more of these, lots more, we wanted to look at these amazing animals on a daily basis. We decided to begin a serious breeding program using AI service's incorporating some of the top bulls in the country, such as Boomerang CP, Awesome Viagra, Top Caliber, JR Grand Slam, JP Rio Grande, Drag Iron, Awesome Martin Luther, WS Jamakizm, and MC Super Rex. After a short period of time we realized we were on a path to producing some outstanding Longhorn cattle. The more involved we became, the more exciting it was. We started to participate with our Longhorns at the Millennium Futurity, TLMA Longhorn Extravaganza, ITLA World Show, TLBAA World Show, and the fabulous Texas Longhorn Legacy Sale. Our goal at Rocking G Texas Longhorns is to produce the best quality Texas Longhorns possible. We concentrate on conformation, horn, color, milking ability, easy going temperaments, and genetic history. Our “motto” is to produce healthy Texas Longhorns by "Breeding to the Best, to Produce the Best", and offering quality Texas Longhorns at reasonable prices. All the calves we produce have the advantage of being "Millennium Futurity" eligible. 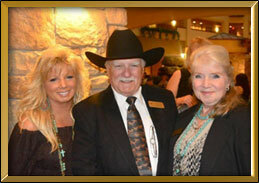 Our goal is also to help provide Texas Longhorns to newcomers who are just discovering this wonderful breed of cattle. We want to share our success, and experience with all who are interested in top quality Texas Longhorns, and we wish to thank so many friends along the way who have helped us toward our goal. We are members of Texas Longhorn Marketing Alliance (Founding Members), International Texas Longhorn Asso., Texas Longhorn Breeders Asso. of America, North Texas Longhorn Breeders Asso., and we are looking to share with others our beautiful Texas Longhorns. Our website gives an example of the quality Longhorns we have to offer. If you have questions please just give us a call anytime. Come for a visit, Longhorn lovers always welcome.